Mahindra and Mahindra has officially announced that the name of their upcoming compact SUV will be Mahindra Quanto. 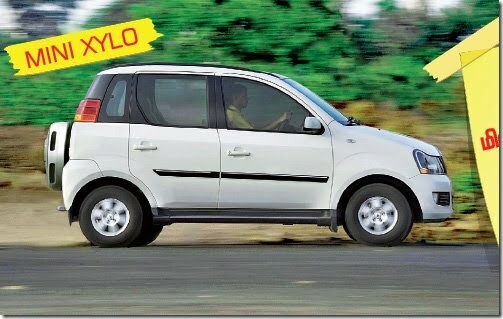 The Quanto will be launched in India towards the end of September 2012 which is the official confirmation from M&M. The Quanto has been designed and developed indigenously in India based on the reliable Ingenio platform of Mahindra Xylo MPV. Quanto means a product with space, power and superior performance. It will have high space, superior comfort and power compared to the small cars including the hatchbacks and sedans in this segment. Mahindra has used customer’s input and requirements in mind while developing this unique offering and has done a lot of research in the development stages of the Quanto. Some of the key features of the Quanto will be easy maneuverability, compact form factor, ability to take on rough and bad roads, suitable for daily commute as well as weekend getaways. With a length of under 4 meters, its not only compact, but also enjoys lower excise duty which will translate into aggressive pricing. “Customer centric Innovation has always been at the heart of any product development at the Mahindra Group. With the Quanto, Mahindra is aiming to fill a need gap in the Indian automotive market for a versatile and compact SUV. We are confident that with its unique value proposition, the Quanto will carve out a segment for itself in the market. The Quanto will cater to the needs of young urban India which enjoys an active lifestyle. We expect the Quanto to offer an exciting upgrade at a premium to customers who are otherwise looking for premium diesel hatchbacks or entry level diesel sedans”. Mahindra Quanto will be the official name of the Mahindra Xylo Mini SUV which has been spotted several times on Indian roads under tests. The car is about to hit the showrooms soon with a 3 cylinder 99 BHP Diesel Engine, for more details on engine, check out – Mahindra Quanto Detailed Engine Specifications. The Mini-SUV aka Xylo Mini or U203 has been designed to be under 4 meters in length which will make it eligible for lower excise bracket because of which it will be priced very aggressively. Mahindra and Mahindra is quite tight lipped about their upcoming compact MPV Mahindra Xylo Mini aka Mahindra Quanto but the car is under testing forever and we have seen spy shots of the car floating all over the web in different camouflage coverings. This is the first ever spy picture we bring you where the car is completely exposed from the side with every visual element clearly visible. The front of the Quanto is exactly the same as 2012 new Mahindra Xylo which was launched earlier in 2012. The headlamps and the front bumper is same, the grill also appears to be carried from the new Xylo. The front wheel arches also seem to be the same however the wheel size seems to be slightly smaller considering the smaller size of the new car. The alloy wheels seem quite similar to what we see in the new Xylo. The outside door handles and outside rear view mirrors are also body coloured. The car seems quite sporty and more like a compact SUV like the Premier Rio which is a 5 seater. Talking of seating capacity, the Xylo Mini aka Quanto seems to have only two rows of seats while there maybe an option of two jump seats at rear for children. Talking of some other details of the visual elements, there are roof rails and side mouldings which are black in colour, there seem to be door sills outside below the side doors which are grayish in colour. The rear wheel arch is merger in the rear door, bumper and the rear body panel as the car is noticeably smaller than the elder and larger Xylo. Also there are blackened B and C Pillars with a small quarter glass which gives the car a sporty look. The rear tail lamps are placed in the level of side windows and they significantly wrap on the sides giving it a very smart look. The spare wheel at the rear is covered in a plastic wheel casing which gives it an upmarket look from the rear. All in all, the Mini Xylo is designed to keep the sportiness in mind and is highly likely to attract youth buyers who would like to opt for a Quanto over a hatchback. Why we believe so is because of the pricing which is expected to be close to Rs. 5 Lakhs because of the excise duty benefits as the Xylo will be placed in the small car segment. More details will unveil soon, we will update this section as more details arrive. You can bookmark this page and come back later to check for latest details. For all the latest updates on Mahindra Quanto aka Xylo Mini, stay tuned to Car Blog India.